I left one of my many author birthday calendars out on my desk. 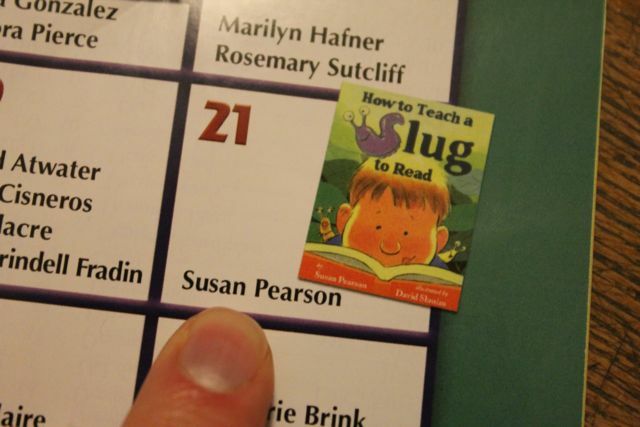 My daughter found it and pointed to the picture of the book, How to Teach a Slug to Read, that was in the box for December 21st next to Susan Pearson's name. She said, "Can we read that book?" I told her, "We don't have it here at home, but we could look for it at the library." Her curiosity made me curious. Who was Susan Pearson? What other books did she write? After trips to two libraries, I found the slug book my daughter wanted to read plus another book about slugs. One of the other books in the stack was about feet. I wondered, Could we combine these three books into a birthday celebration? Slugs. Feet. Sure! Of course we could...Now are YOU curious? Susan Pearson is the author of over 30 books for children including We're Going on a Ghost Hunt, Happy Birthday, Grampie, and Who Swallowed Harold? : And Other Poems about Pets. She wrote her first book, My Booklet, in the third grade. Mrs. Anderson, her teacher, would ask her and her classmates to make booklets about the topics they were learning in class. "I think I got tired of making booklets for Mrs. Anderson and started making booklets for me." She followed up My Booklet with My Booklet 2 and many other sequels. (Minnesota Reflections). She continued writing in her adolescent years, mainly in journals, and then decided to major in English in college. During her senior year she needed a few more credits to graduate. 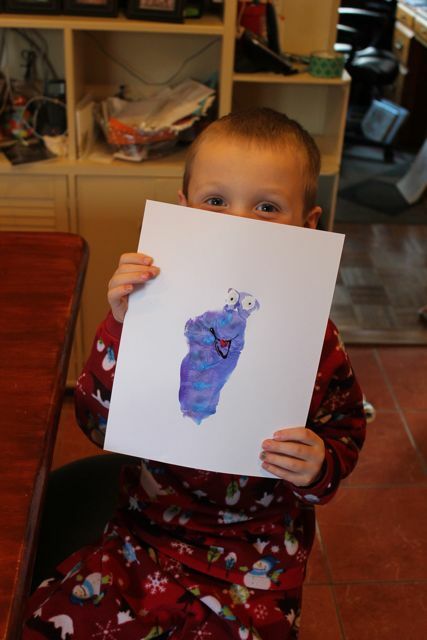 She was granted permission for an independent project and she chose to write and illustrate a children's book. The book she made, If I Were a Circle, was shown to publishers but was never published. However, Susan enjoyed the positive feedback and decided to develop a portfolio to pursue children's book publishing. On one of her visits to a publisher to show her portfolio she was offered a job as an editorial assistant with Viking Press. This job helped her "learn more about writing...than anywhere else." One of her duties was to read the hundreds of unsolicited manuscripts sent to the publisher. She said, "I learned what NOT to do in my own manuscripts." (Minnesota Reflections). Susan took everything she learned from her first job and then while working as Assistant Editor at The Dial Press she published her first book, Izzie, which was named New York Times Outstanding Book of the Year in 1975. Her success with this book was the beginning of a steady career as a children's book author and editor. Susan served as editor at Carolrhoda Books and many other publishers all while publishing a variety of children's books. Her latest book, Arlo Rolled was published in 2014. 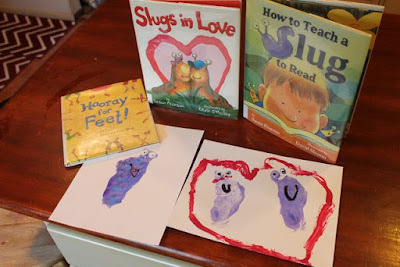 I couldn't wait to read How to Teach a Slug to Read to my daughter. In this book I learned 10 steps to teach a slug to read including Finding a really good book or your slug will lose interest and Be patient. Reading isn't learned in a day. 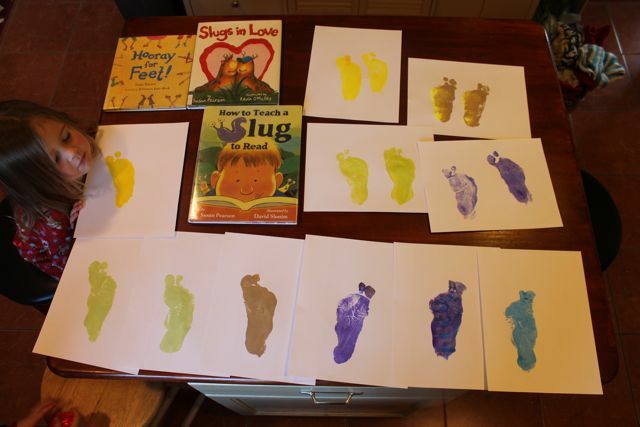 I was also excited about Slugs in Love, a story about love at first slime! 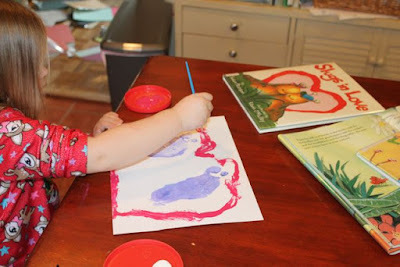 Marylou, a slug who wears pretty pink bows, admires Herbie from afar and begins writing poetry to him with her slime around the farm; on the watering can, on veggies in the garden, and on the scarecrow. Herbie responds with his own poetry, but the two never meet until Marylou writes on the roof of the barn, "Your rhyme is sublime, Herbie, dear, I am here!". The slugs finally meet, fall in love, and live happily ever after. 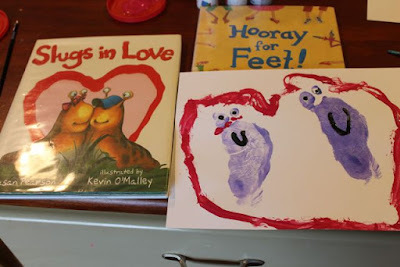 I read the two books about slugs to my youngest two children and then I pulled out Hooray for Feet!, another book by Susan Pearson that I found at the library. 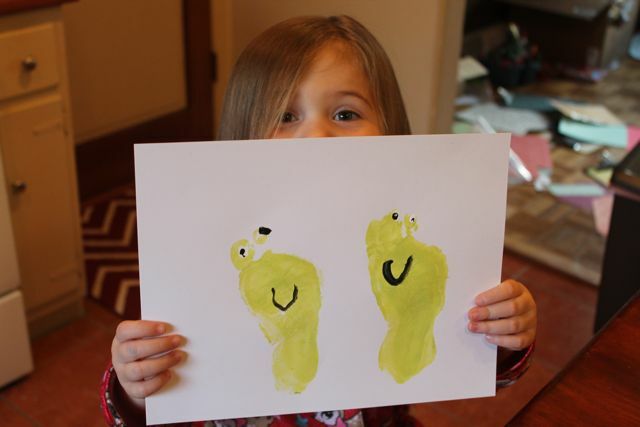 It is a cute rhyming book all about the cool things feet can do. After finishing the book, I said to them, "OK! 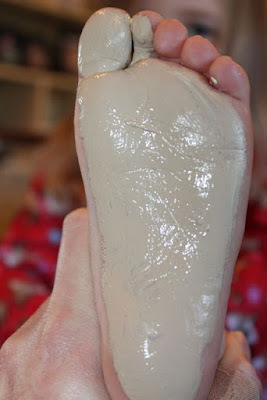 We are going to do a craft about slugs and feet." My daughter was excited. My son was skeptical and resistant. 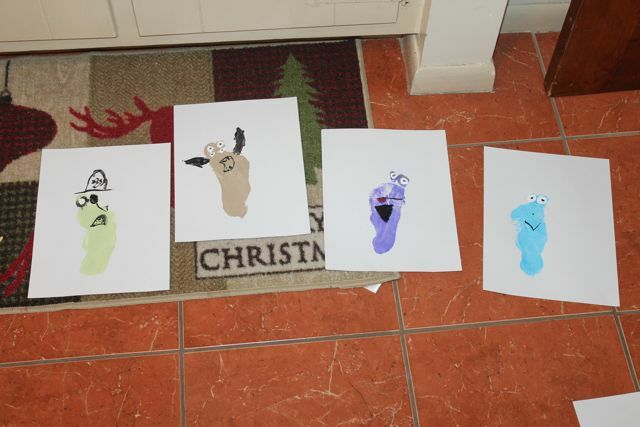 So, I explained, "We are going to paint our feet. Stamp them on paper. Then, make them look like slugs." My daughter was even more excited because she did a similar activity in preschool where they made feet and hand prints look like a reindeer. My son however was not happy. But, can you blame him. Slugs and feet. What a weird idea, Dad! I told my son to join us later if he wanted. So, my daughter and I went into the kitchen to try it out. Try it out. Yes, I didn't try this activity before I did it with them. I had no idea if it was going to work. To be honest, when my son was skeptical about the activity I was starting to doubt myself. 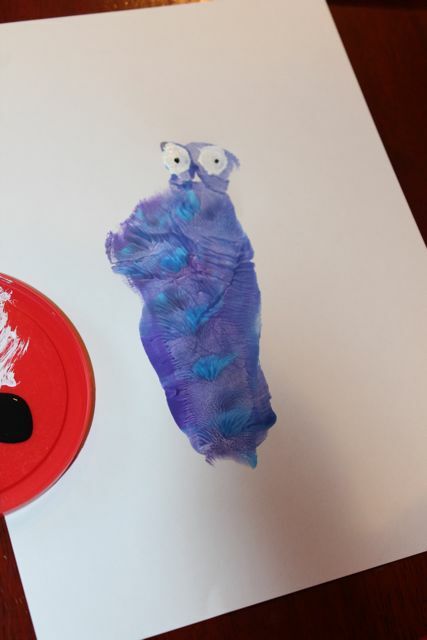 But, I was curious to see if painting my daughter's foot and two of her toes would actually look like a slug when it was stamped on paper. 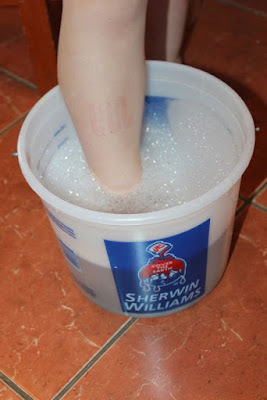 My daughter suggested having a bucket, washcloth, and a towel ready to clean her feet. I guess they did this at preschool when they made the reindeer. It wasn't long before my son came into the kitchen. I asked him if he would take pictures for me. I knew if he stayed in the kitchen long enough he would want to participate in the activity. I held my daughter's foot and pressed the paper onto it. I thought this would work better than having her try to stamp her foot onto the paper. 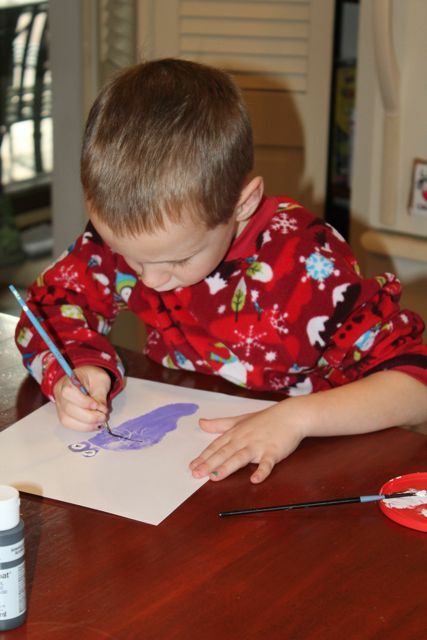 Once, my son saw that the stamp looked like the shape of a slug, he wanted to try it! We made many slug stamps in a variety of colors. We let them dry for about ten minutes before we started the next step. My son said, "This is a lot cooler than I thought it was going to be." The next step was to add eyes. A smile! 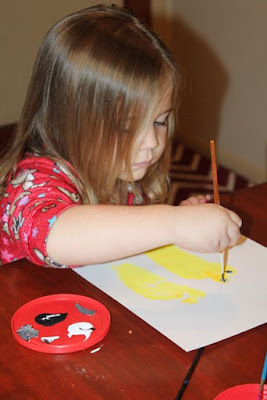 This activity turned out to be a lot cooler than I thought it was going to be too! Here are the first two slugs my daughter made. Next, she decided to paint a heart around two purple slugs because they were in love. She asked me to paint pink bows on one of the slugs to make it look like Marylou in the book. 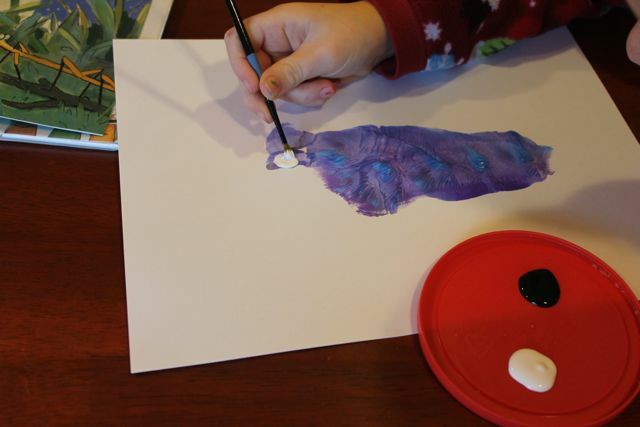 A serious artist painting a silly face on a slug. She painted eyelashes above the eyes for these two yellow slugs. My son made slug pirates and slugs with goatees! These were inspired by illustrations in How to Teach a Slug to Read. 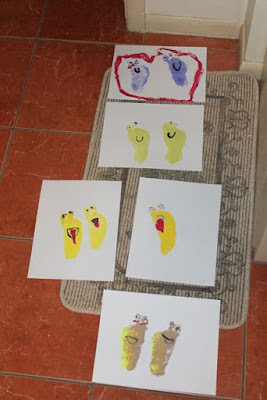 My daughter made a few slugs with their tongues sticking out! We are in love with these slugs and these books! Susan, our family wishes you a very happy birthday. We hope you had a wonderful day with family and friends. Thank you for making books that sparked our curiosity and creativity!